When you start your driving lessons you need a nurturing environment. That's why we have a no shouting policy. It's our responsibility to make sure you are comfortable behind the wheel. Which is why our instructors get that little bit extra training above the standard you'll usually see out there. As a student you are only as good as the training you receive and that training has to be catered to your individual needs. Our instructors passion for driving is infectious and aimed at one thing. You, our student, and your safe development into a competent driver. No other Ballyvaughan Driving Schools offer free material like ours. Many of our pupils have even attributed it to their fast progress and development. Covering vital driving skills like driving at night, road positioning and traffic progression this training is like having your own driving instructor with you 24/7. When we were in school we all had our favorite teachers, the ones that engaged us and made learning fun. And we can recall the bad teachers that had no business teaching anyone. Not all teachers are made equal and that is certainly no less true with approved driving instructors. It is easy to Google 'Driving Lessons Ballyvaughan' and find driving instructors near you but which can you trust to best teach you. Naturally you want to choose a driving school that has a great track record. A driving school that gets people past the test. 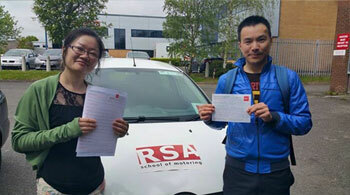 We have helped hundreds of learners pass the test so before you carry on your search we encourage you to consider RSA School of Motoring for your driver training in Ballyvaughan. Let us explain to you why. There is learning the vital driving skills and developing your knowledge of road signs and road safety. And then there is learning to pass the driving test. The test is your chance to show that you are safe enough to drive unaccompanied. Like any exam you have ever had to sit, 80% of passing the driving test is accomplished long before the day of the test with proper preparation. Check out pretest lessons in Ballyvaughan here... or Call 061 574 797 now to book your pretest package. Can I learn in an Automatic Car with your Clare driving school? If you want to learn to driving an automatic in Ballyvaughan then you're not alone and we can help. Give us a call today and we’ll get you booked in with your nearest automatic instructor. Do you want to do your Clare driving lessons with a lady instructor? Your wish is our command. You can take your essential driver training or pretest lessons with one of our female driving instructors. Just give us a call to book in. In busy times like these we all want convenience and flexibility and this is no less true with taking driving lessons. That is why our driving instructors will pick you up and drop you off from your chosen Clare locations*, be it work, home or college.